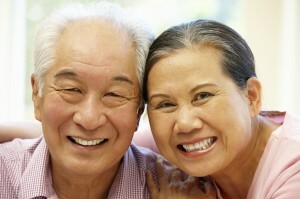 The benefits of filling the spaces left by missing teeth are vast. Not only will doing so make you look better, but it can improve your self-esteem and quality of life, and health. After all, with missing teeth, speech can be affected and your chewing ability is compromised. So, what is the best solution for filling these gaps, and what are the benefits of dentures vs implants? While dentures are the less expensive option, most people find that the benefits of tooth implants far outweigh their additional expense. Gum recession and jaw bone density loss is typically associated with denture wearers, while dental implants fill the missing tooth root to support bone anatomy and density. This gum loss can lead to poor fitting dentures and the need to use messy denture adhesives to achieve a more secure fit. With dental implants in Dr. Stone’s office, there are no denture fit issues or need for adjustment, and a single implant can support a crown, with multiple implants able to restore many missing teeth. Once the implant is secure it acts like a normal tooth root. You can say goodbye to trouble pronouncing specific words, and eat the foods you used to love. Speech is generally improved by filling any gaps in your mouth, and our teeth in a day service allows you to live, love, and laugh with confidence. Resolve the dentures vs implants question once and for all by requesting an appointment for a dental implant consultation or call us with any questions at (954) 568-9100. Read more about the Dentures vs Implants debate in our blog.